Bowie and Nocona boy’s basketball teams matched up for the second and final time on Tuesday night in Bowie on senior night. The Jackrabbits were able to ride a one-sided third quarter to a 55-45 win against the Indians to earn the series sweep against their rivals. Both teams were dealing with injuries as Bowie had Taylor Pigg out and Nocona had leading scorer Jason Sparkman out. Both teams decided start big lineups, the Indians to try and matchup with the Jackrabbits Daniel Mosley and Bowie to see if they could double up on that advantage. The Jackrabbits started the game well, jumping out to a 6-1 lead midway through the first quarter. Nocona was able to get some shooters open coming off screens and knocked in a pair of three-pointers to cut the lead to 9-7. Bowie was able to find ways to get the ball inside and capitalize on open perimeter shots as they ended the quarter with three baskets as they led 15-11. The second quarter went much more the way of the Indians at first. While they were never able to grab the lead from the Jackrabbits, Nocona cut the lead to 18-17 midway through the quarter as Bowie struggled to score. The Jackrabbits were able to open themselves up enough as baskets from Mosley and Evan Kennedy off the bench allowed Bowie to keep its lead. The Indians were still within shooting distance though as the Jackrabbits led 26-21 at halftime. The second half started and it was all Bowie. The Jackrabbits aggressively started going for steals both on the ball and off. They were able to take advantage of this by getting out and running in transition as they started the third quarter on an 8-2 run in the first two and half minutes. With a double digit lead Bowie could have settled things down, but the foot stayed on the gas for the rest of the quarter. Not only could Nocona not keep up, they had trouble scoring at all. Shooters coming off screens were not getting the clean looks they were getting in the first half as the Jackrabbits did better at fighting through the screens and contesting shots. 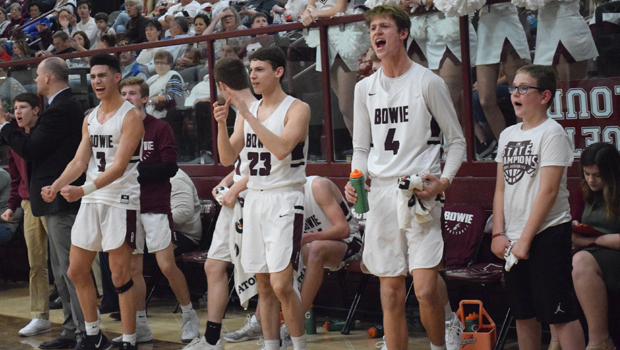 Bowie’s offense continued to flourish in transition as Justin Franklin balanced scoring himself and throwing no-look passes to teammates. By the end of the quarter, the Jackrabbits’ lead had grown to 48-27 and the game was pretty much a forgone conclusion. The fourth quarter saw Bowie mostly able to keep any comeback attempts at bay as the lead stayed above double digits. With two minutes to go, Horton got his bench in. They struggled as Nocona was able to force turnovers and score off of them to make the final score closer than it was for all of the second half. While it was a sour end for the Jackrabbits, they still got the win 55-45.